To most people I imagine the ingredient listing on their bottle of shampoo or hand lotion might as well be written in a foreign language. But if you know the key you can work out not only what chemicals are in them but have a pretty good idea of their origin as well. Take for instance sorbitan palmitate. This made by reacting sorbitol and palmitic acid. Sorbitol is a sugar that is found in trees and bushes of the rowan family. Palmitic acid is found in lots of vegetable oils. One important source is palm oil, which is where it gets the name from, but you can just as easily get it from rapeseed oil or olive oil or a great many other oils. If you put your mind to it you could make it from mineral oil with a few more stages. There is a whole family of cosmetic raw materials that can be made by reacting similar materials all with slightly different uses. Palm oil is a very good starting point for a lot of the things you see on ingredient lists. Palmitate is a dead give away – but you can also get stearates and laurates among others from palm oil. On the other hand you can get palmitate from other sources than palm oil. So although you can have a pretty good guess what your product was originally made from you can’t be sure unless you actually trace back the ingredients all the way to the original farm. All of this is interesting enough, but in recent years it has become a matter of some controversy. Palm oil can be used to make all sorts of things, mainly foods but also is a very good biofuel. The growing interest in biofuels combined with the general economic boom has increased the demand for palm oil. The area given over to palm oil plantations in South East Asia has increased at the expense of tropical rainforests. This is unfortunate for a lot of reasons, but it is particuarly hard on the Orang Utan’s who live there and find their habitat destroyed. Not surprisingly pressure has grown to come up with a way of protecting the rain forest. It is possible to grow palm oil in a sustainable way that doesn’t encroach on primal jungles. The problem comes if you want to give people proof that they aren’t buying palm oil that is grown on virgin rain forest. The problem is that palm oil is a huge huge industry with around 30 million tonnes being produced every year and used in a huge range of applications. Most of the users have not the slightest interest in the original source of the oil and it passes through many hands and many manufacturing processes before ending up in the bottle on your bathroom shelf. It seems like an impossible task to make sure that any given product only uses ethical palm oil. And indeed it is. But someone has come up with an idea. The greenpalm website allows you to trade in certificates for ethical palm oil. The idea is you sit down and work out how much palm oil has gone into say a bottle of shampoo. You then go onto the website and buy a certificate to cover that much palm oil. The company behind the website makes sure that the certificates are only issued to plantations that have produced ethical sustainable palm oil. This ethically source palm oil will have gone into the general palm oil market and could have been used for biofuel, lubrication, ice-cream manufacture or whatever. But you have your certificate to show that an equivalent amount of palm oil has been produced ethically to that which you have used. You can therefore say that for all intents and purposes your impact on the rain forest is the same as if you had used the ethical stuff yourself. It is very much the same idea as planting a tree to offset the carbon dioxide generated when you cross the Atlantic. There are companies that will sort that out for you at a fee as well. I really don’t know what to make of this idea. On one hand I can see how in theory it means that more ethically produced palm oil will be produced than might be the case if the scheme didn’t exist. On the other hand it just seems weird, and somehow wrong. I am a big fan of biodiversity as a scientist and if I thought it was going to work I think I would have to support it. I like Orang Utans too and would hate to see them go extinct in the wild. But it still seems that we are handing over cheques directly to people who are completely reckless in their approach to palm oil production. I can’t help thinking that starting a fund to buy up tropical rainforest to stop it falling into the hands of the palm oil farmers is going to be a lot more straightforward and effective way to protect our primate relatives. 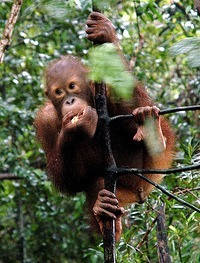 Thanks to cornstaruk on Flickr for his picture of a baby orang utan. This entry was posted in Natural, Organic and Environment on May 14, 2009 by Colin. Can you say whether oils like Rice Bran oil or Sun-flower is safe to use? content to suit your needs? I wouldn’t mind publishing a post or elaborating on a lot of the subjects you write related to here. Hello Edie, thanks for the offer but I have never run guest posts and I think that it wouldn’t really work if I did.